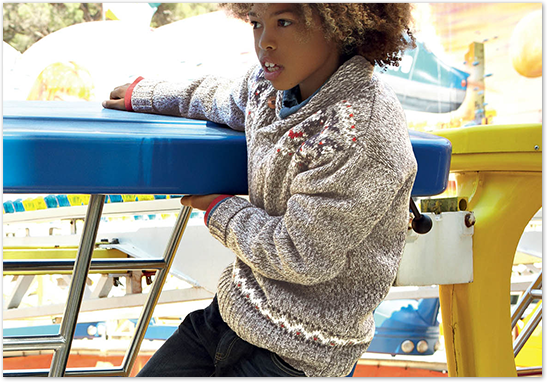 More than ever, fleece is taking up its winter quarters and invading the wardrobes of budding fashionistas. For girls, oversized dresses and hoodies in autumn colours are a must. 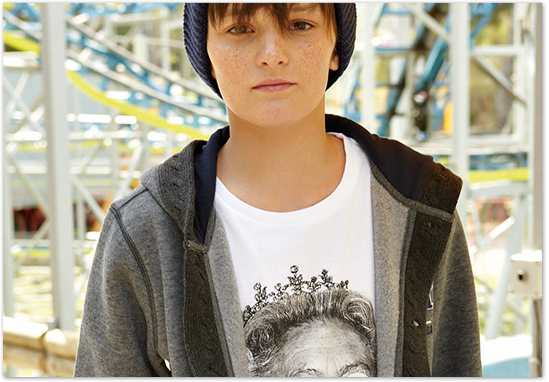 For boys, the hooded sweatshirt comes in blue and orange. Specific treatments are applied to each style: more delicate, vintage, and stonewashed for girls, scratched and even lined fleeces for boys. This season, we are also adding a new line of jerseys to our collection, with diverse tactile surfaces (peach skin or rustic) and various looks (simple, mottled, or flaming). Between the city and the mountains lies only one step. The mottled stitch style is available with a shawl collar in argyle coupled with a plaid shirt to complete the look. Parkas are naturally a must—the sleeveless or bubble version for boys, while the fur-adorned hooded style is dedicated to girls. But the must-have of the season is the coloured skinny jeans (tan, turquoise, or burgundy); sensible colours capable of highlighting any look. Grey or uncut jeans, however, are an essential for boys this season. New in the world of kidswear, Little Cerise girl clothes. The bold yet feminine Le Temps de Cerise for women now brings – on demand – a girls’ line (size from 104 till 164) at affordable prices.